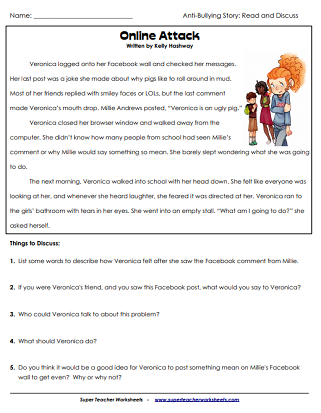 This page contains a collection of printable anti-bullying stories for students to read and discuss. Darren didn't do well on his latest spelling test. When one of his classmates steals the failing paper from his hands and broadcasts his grade to the class, Darren feels very embarrassed. Is this bullying? What should he do? Danny normally sits with Marcus in the cafeteria, but today Marcus is absent. When he tries to find another table to sit at, he finds that his classmates are less than welcoming. Is he being bullied? What should Danny do? Beth just got new glasses, but she refuses to wear them in school because she thinks her classmates are staring at her. Is she being bullied? What should Beth do? Ryan is playing volleyball with his classmates. When kids start making comments about his weight, he tries ignoring them. However, their hurtful words are very upsetting. What should he do? When three friends are playing tag on the playground, two of them end up in an angry shouting match with each other. Can you tell which friend is being the bully? Veronica sees that a nasty, hurtful comment was posted on her Facebook wall. She's angry and embarrassed. Did her friends see it? Who can she turn to for support? What should she do? Katelyn wants to watch a PG movie, but Hilary wants to watch a Rated-R movie. When Hilary tells all of the girls in school that Katelyn is a baby because she isn't allowed to watch R-rated movies, Katelyn becomes embarrassed. What should she do? When Emily wants to befriend two girls on the playground, her close friend Melinda objects. What should Emily do when she is forced to choose between an old friend and new ones? Jamal is one of the only kids in his class who doesn't have the new Space Walker sneakers, but with his father out of work, his family can't afford expensive shoes. What will he tell his friends when they want to know when he's getting his Space Walkers? This poem teaches kids how to recognize a bully, and what to do if you see a friend being bullied. 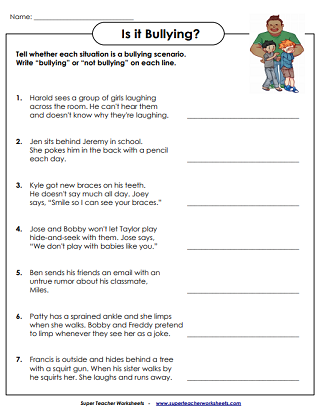 Determine whether there is bullying in each scenario given. Write 'bullying' or 'not bullying' on each line. These worksheets can teach kids how to stay safe online. 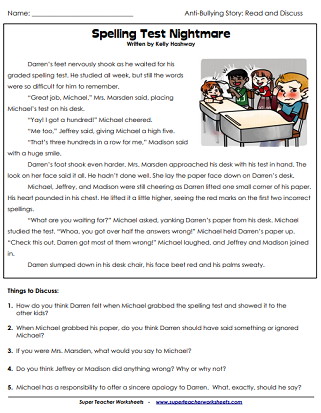 We have reading comprehension activities for all elementary grade levels. Includes fiction, non-fiction, poems, and more.